We will be open this year for Easter-reservations can be made via open table or calling 631-647-9300. We will have Easter Specials in addition to our regular brunch menu. Last seating at 5 pm. Click image below for the specials! 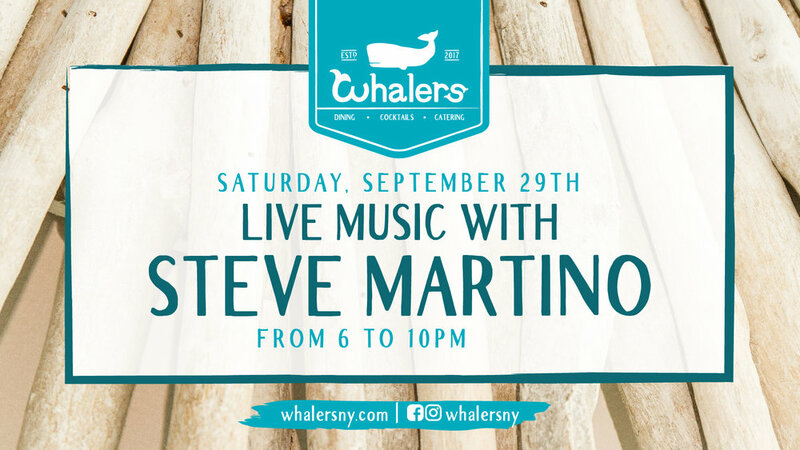 Live Music with: Steve Martino! Join us for Valentine’s Day at Whalers with some amazing specials! Regular menu will also be available. Valentine’s Day Specials will be available Thurs 2/14-Sat 2/16 for dinner only. For those who dine on 2/14, a complimentary mini bottle of prosecco will be given for each couple! * We will also have live music by Acoustic Blue from 6-9 on Valentine’s Day to serenade you while you dine. *while supplies last, one per couple only. Click Image above for menu! Credit card required to hold reservations. Must cancel by 12/28 at 6 pm otherwise you will be charged full price of the event per person booked. If you want to see the band only-$20 at the door includes a glass of champagne and a new years favor! Wear your ugliest Christmas sweater! Best sweater will win a $200 gift card to Whalers! Credit card is required to hold reservation. Please have credit card ready when calling to make your reservation! Click the image above for the menu! Tradewinds will be here and we hope you're ready to get swept away by their awesome sound! Music starts at 9pm. Kick back and relax with some sweet tunes from Acoustic Blue right here at Whalers! Music starts at 8pm. Join us here at Whaler's during Long Island Restaurant week! We'll be serving up a three course prix fixe menu for $29.95 per person and you won't want to miss it. Dinner time only - 5pm or later! Call us at (631) 647-9300 now to make your reservations! We're closing out this month of music in style with Joe Ferrari at the wheel! Don't miss his sweet sounds when he stops by for brunch! Music starts at 12pm. We've got Kate Van Dorn stopping by to perform for us right here at Whalers and you've got to come and listen! Music starts at 6pm. 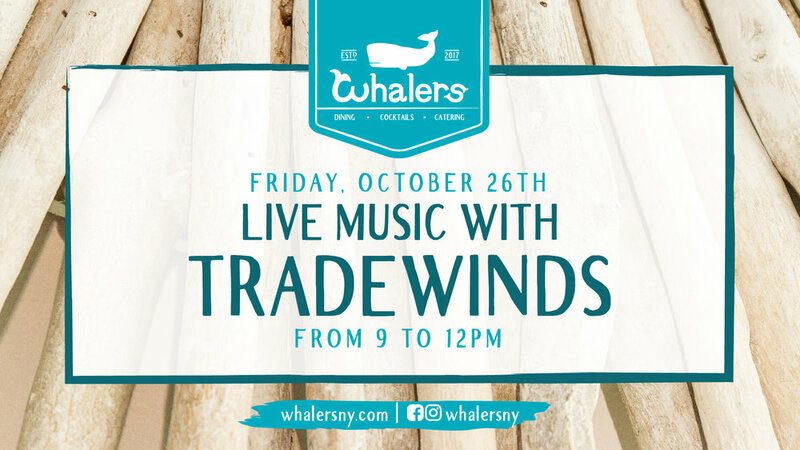 Go with the breeze and get swept into Whalers because Tradewinds is stopping by to perform! Get your groove on with us! Music starts at 9pm. Have your Halloween celebrations at Whalers! Wear your spookiest costume and get ready for a night of Halloween fun! While you're here, we'll also have live music with Tradewinds. It all kicks off at 9pm and you won't want to miss it! 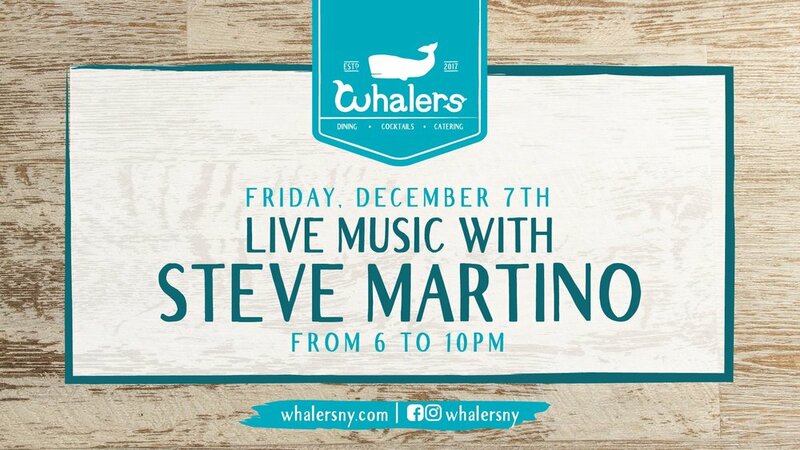 Check out Steve Martino when he stops by to brighten up brunch here at Whalers! Music starts at 2pm. Don't miss Mike McGarry when he stops by to perform for us! Music starts at 6pm. Catch Joe Scollo when he stops by to serenade us while you get your brunch on! Music starts at 12:30pm. Need some pep in your step? Get energized with us when you listen to Steve Martino's sweet tunes! Music starts at 6pm. It's time to get nostalgic with That 70's Band! Swing by to jam out with them and have an amazing night! Music starts at 8:30pm. There will be a $15 cover. 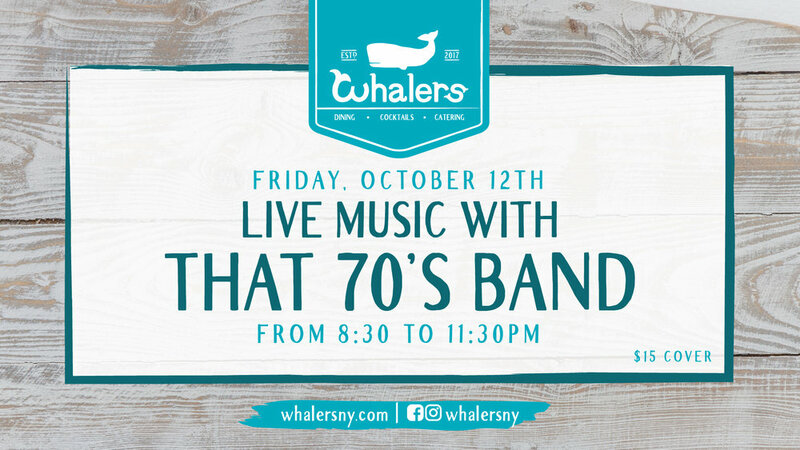 Wilson Brothers Band is going to be right here at Whalers to rock out while you dine in with us! Music starts at 6pm. Ready to turn back time? Good, because Retro is coming to Whalers! They'll be delivering some amazing tunes and you've got to see them! Music starts at 6pm. Join us when Billboard Live stops by! As they bring the entertainment, we'll bring along the food and drinks to keep you going. Music starts at 8:30pm. Speed on over to Whalers and check out Joe Ferrari when he stops by to jam out with us! Music starts at 5:30pm. We're closing out September with Steve Martino! While he offers up those sweet sounds, we'll be offering up those good eats! Music starts at 6pm.